The easiest way to give your ragdoll cat pill is to crush the power into a powdery form by putting it between two spoons. Once the pill is powder, mix it in with some wet cat food. 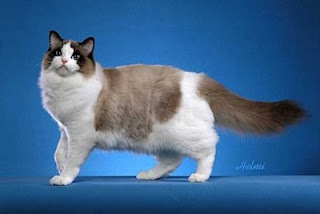 Ragdoll Cats are used to eating dry food will see the wet food and think of it as a treat. They will eat it up, unaware that they just took their medicine. all you have to do If the medicine happens to be in capsule form, is too pry the capsule apart then sprinkle the medicine on some wet food and serve it to your pet. If the food also contains the pill or if your pet is sick, chances are he won’t eat it. In this event, you should look into a pet piller. You can get these handy devices from your veterinarian. They are plastic rods that hold the pill until you press a plunger. When you get one, you should always get a long one with a softer tip. When you get your gun, your vet should show you how to use it. The most difficult aspect of using the gun is getting your cat to open his mouth. The gun will more or less shoot the pill in the cat’s mouth, and down his throat. You’ll need to hold him tight, to make sure that he doesn’t wiggle his way loose. Once you have his mouth open, you’ll need to squeeze the trigger and pull the gun away quickly. After the pill has been inserted, make sure you give your cat a treat. Or you can try giving your cat his pills by your hand. open his mouth with your hand slowly. Once you have his mouth open, you should aim for the back of his throat and throw the pill in. Once it is in his mouth, you should close his mouth with your hand and hold it shut for a few moments. if he hasn’t already, your cat will swallow the pill. you can go to a local pharmacy and get them to a make flavored gel or liquid using your cats medication, If you can’t get any of the above techniques to work. You should use this as a last selection.